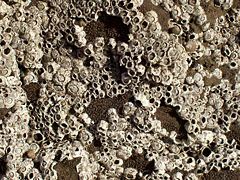 Barnacles are exclusively marine, sessile crustaceans comprising the taxonomic group Cirripedia. Typical barnacles (stalked and acorn barnacles) are characterized by a calcareous shell, or carapace, but there are also naked barnacles without shells, including ones that parasitize other invertebrates and some that bore through shells and corals. Typical barnacles are distinguished from other crustacean groups (crabs, copepods, shrimp, etc.) by their permanently attached mode of existence. Barnacles are a widespread and common marine group, with around 1,220 species currently known. They dominate various areas of rocky littoral zones and some species have vast numbers of individuals. As with other living organisms, they contribute to ecosystem harmony and energy flow as key parts of food chains, with both larval forms and adults capturing tiny prey and in turn being consumed by a variety of marine life, even when within their calcerous shells. Barnacles also are among the most important of marine fouling organism, and can decrease the speed and increase the fuel consumption of ocean-going vessels (Russell-Hunter 1969). Barnacles are distinguished by the fact that their systematics and distribution was studied for a number of years by Charles Darwin, in his quest to further his ongoing development of the theory of evolution and natural selection. The name "Cirripedia" means "curl-footed." As with other crustaceans—crabs, lobsters, shrimps, copepods, krill, crayfish, etc.—barnacles are characterized by having branched (biramous) appendages, an exoskeleton made up of chitin and calcium, two pairs of antennae that extend in front of the mouth, and paired appendages that act like jaws, with three pairs of biting mouthparts. They share with other arthropods the possession of a segmented body, a pair of jointed appendages on each segment, and a hard exoskeleton that must be periodically shed for growth. Barnacles are generally placed into three or four subgroups. 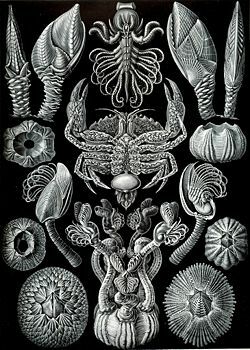 Martin and Davis (2001) place them into three subgroups, Thoracica, Rhizocephala, and Acrothoracica, but some also recognize as barnacles the group Ascothoracida (Russell-Hunter 1969), which Martin and Davis consider as an infraclass outside the infraclass Cirripedia. These groups may be variously considered orders or superorders. Thoracica are the typical shell-forming barnacles; Rhizocephala consist of shell-less barnacles that are parasites on crabs and lobsters; Acrothoracica includes ectoparasites on whales, turtles, sharks, lobsters, and those that bore into shells of mollusks or corals; and Ascothoracida consists of species that are parasites on coelenterates and echinoderms. Russell-Hunter (1969) recognize a fifth major group, Apoda, consisting of a single genus that was discovered and described by Charles Darwin and that parastizes stalked barnacles. The typical barnacles, all placed in Thoracica, include the stalked or gooseneck barnacles that attach to the substrate by means of a stalk and the acorn, or rock, barnacles that attach directly to the substrate. In both, initially the head is first fixed down to the substrate at metamorphosis by head appendages (antennules) with terminal suckers (Russell-Hunter 1969). The adult becomes permanently attached as calcareous plates are secreted, and uses six pairs of biramous, thoracic limbs as a food-catching mechanism, with three to six pairs being involved (Russell-Hunter 1969). In the stalked barnacles, a fleshy stalk supports the head with calcified plates, while in an acorn barnacle the body is totally enclosed in calcareous plates secreted by the mantle (Russell-Hunter 1969). Acrothoracica, with the least modified species, retain a rough acorn barnacle shape. Many live as ectoparastites on whales, turtles, and so forth, and derive food through a root system into the host tissue (Russell-Hunter 1969). Other ectoparasitic members of Acrothoracica live in the gill cavities of lobsters and crabs, while some parasites bore into the shells of mollusks. There are also species of Acrothoracica that bore into coral or limestone rock and continue to use their thoracic appendages in feeding (Russell-Hunter 1969). In Rhizocephala, almost all of whose members are parasites on crabs and lobsters, the adult is merely a branching structure, like a fungus, growing into the host tissue (Russell-Hunter 1969). They do not have an alimentary canal at any stage. In Ascothoracida, the organisms are mostly embedded in host tissues (coelenterates and echinoderms), but the mantle is enormously developed as an absorptive sac (Russell-Hunter 1969). As with other living organisms, in acting for their own survival, maintenance, and reproduction, barnacles also serve a purpose for the ecosystem. Barnacles are numerous and play key roles in food chains. On the one hand, as larvae in the plankton, they are prey to a great many animals. But even the adult Thoracica, with their calcareous shells offering protection, are prey for whelks, periwinkles, fish, the green leaf worm, and others. In turn, barnacles consume a variety of foods that they filter from the water, from 2 microns to 800 microns in length, and even some species have a means to capture larger copepods (Russell-Hunter 1969). Barnacles have two larval stages. The first larval stage is called the nauplius. Cirripede nauplii have a characteristic dorsal spine and frontal horns (Russell-Hunter 1969). The nauplius spends its time as part of the plankton, floating wherever the wind, waves, currents, and tides may take it, while eating and molting. This lasts for about two weeks until the second stage is reached. The second stage is the cyprid (or cypris larva) stage. The nauplius metamorphoses into this non-feeding, more strongly swimming cypris larva. The nauplii's mouth parts are reduced, and the only head appendages are the antennules. A carapace forms a shell. At this point, the cyprid settles down and metamorphoses into an adult barnacle. The cyprids settle down in an area where environmental cues indicate a safe and productive environment, and if they do not, they will die. Both the typical barnacles (Thoracica) and almost all of the parasitic barnacles retain a similar life cycle from the horned nauplius through cyprid stages (Russell-Hunter 1969). Likewise, just as the cyprid stage of the typical barnacles attaches to the substrate, it is usually the cypris larva of the parasitic forms that first attaches to the host organism (Russell-Hunter 1969). In the typical, shell-forming barnacles, when an appropriate place is found, the cypris larva cements itself headfirst to the surface and then undergoes metamorphosis into a juvenile barnacle. Typical barnacles develop six hard armor plates to surround and protect their body. For the rest of their lives they are cemented to the ground, using their feathery legs to capture plankton and gametes when spawning. They are usually found in the intertidal zone. In the parasitic barnacles, metamorphosis into an adult may more or less resemble the Thoracica barnacles. The group Rhizocephala, for example, externally resembles typical cirripedes, but internally has undifferentiated cells in place of a functional alimentary canal (Russell-Hunter 1969). The shell of some barnacles may be discarded to attach and enter the host. Like many invertebrates, barnacles are hermaphroditic and alternate male and female roles over time. Some species of stalked barnacles have dwarf males attached to the mantle of larger females ((Russell-Hunter 1969). Carcinologists (those who study crustaceans) have long debated the taxonomic status of Crustacea, sometimes assigning the group to one of the phylum, subphylum, and superclass level, with 5, 6, or even 10 classes recognized (Hobbs 2003). Many also list the Crustacea as a class. One class of Crustacea typically recognized is Maxillopoda, into which is placed the barnacles, as well as copepods and other crustaceans. In some taxonomic schemes that consider the Crustacea to be a "class," Maxillopoda is considered an order. Some biological classification do not recognize Maxillopoda as a class, but recognize the barnacles, copepods, and others in the group as separate classes, with Cirripedia being the class into which barnacles are placed. This article follows Martin and Davis (2001) in placing Cirripedia as an infraorder of class Maxillopoda and subclass Thecostraca. (Other subclasses recognized under Maxillopoda include Copepoda, Mystacocarida, Pentastomida, Branchiura, and Tantulocarida.). The following classification of cirripedes from Martin and Davis is represented down to the level of orders. Hobbs, H. H. 2003. Crustacea. In Encyclopedia of Caves and Karst Science. Routledge. Retrieved December 5, 2006. Martin, J. W., and G. E. Davis. 2001. An Updated Classification of the Recent Crustacea. Natural History Museum of Los Angeles County. This page was last modified on 29 August 2008, at 13:17.